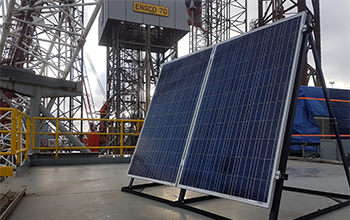 Following a request from Enso in February RCP were set the challenge of supplying a humidity & fire detection unit for the Ensco 70 currently cold stacked in Hartlepool. Ensco were looking to have the ability to monitor the system remotely, oh yes and we completed the job 3 weeks from PO. Within the short period inhouse engineers designed and built a full system using the solar panel for power (with battery back-up) to monitor relative humidity and smoke within the rig. Should any of the sensors be triggered not only would Ensco receive desk top notification they would also receive SMS text notification allowing them to take immediate action. 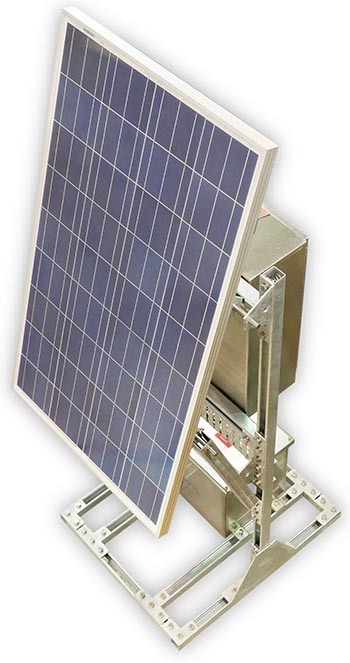 Each of our hazardous area solar power units are built to efficiently power electrical equipment and charge battery banks during daylight hours. The battery bank will then power electrical equipment in darkness. Our sophisticated charge controllers monitor and protect the battery bank to ensure optimum availability. All our units are designed and built to order and RCP engineers will discuss your full requirements with you prior to design and supply. 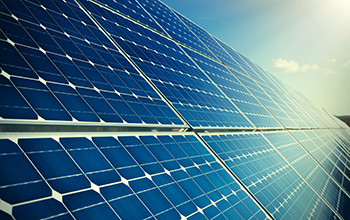 Our AC solar power units are available with GSM, Wi-Fi and data recording.